Growth vs. Profit – What’s the goal behind International Payments? That depends. Some in the international payments sector believe the sector must commoditise, forcing all transfer pricing to zero and landing all payments companies in the same place. This assumption is 100% wrong. Here’s why. Our research team split the players in our space into two groups based on whether their primary goal is currently growth or profit. The industry is split between these two goals unlike more mature industries such as mortgages or cars which could be depicted with virtually every player on the right side (profit). 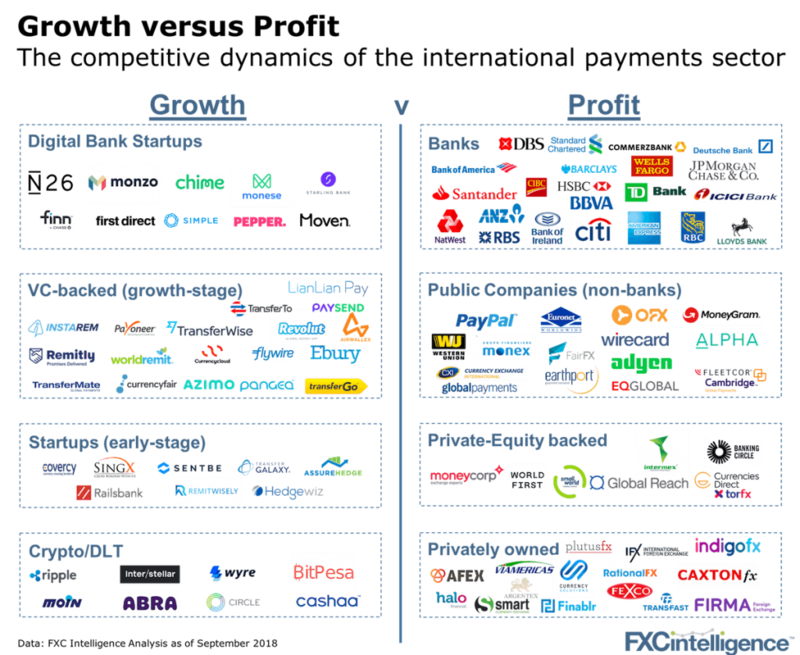 This diverse set of companies depicted above, with different ownership structures and goals is going to lead to different outcomes. Different ends mean different means Companies that focus on growth behave considerably differently from companies focused on profit. The following graphic shares just a few of these high-level differences in behaviour. 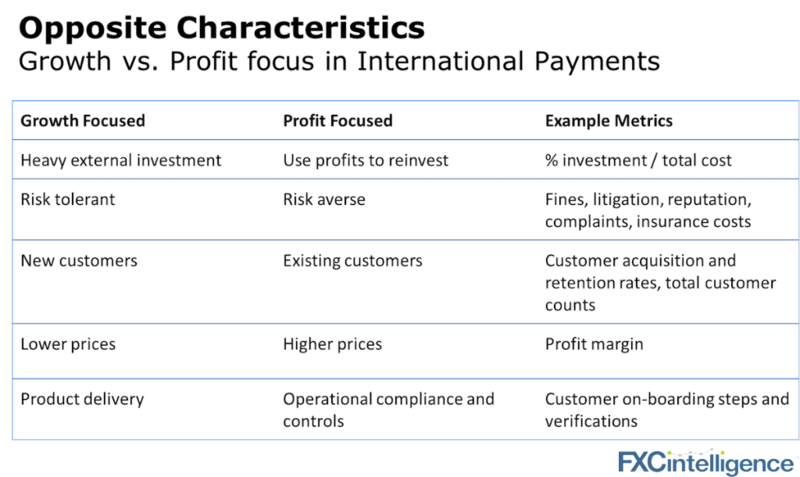 This list (which is by no means comprehensive) highlights how different behaviour of a company is depending whether they have growth or profit as their primary goal. It’s still growth OR profit: TransferWise reported high growth (75%) and limited profit in the 2017 earnings they announced this week. It is clear they are still focused on growth and their many price cuts are driving user numbers, not profit. Diversity of products: The sector will continue to produce a wide range of products with pronounced differences between what is offered by growth and profit-focused players. The growth-focused companies have no choice. The skillset of vetting your customers: Players in the international payment space must work harder than participants in other industries at vetting customers. The average company does not face the same large risks encountered by international payments companies. Any payments company that is focusing on delivering products without properly vetting customers is missing half the ingredients for success. New and great products are so often associated with growth companies, whereas deep compliance expertise is mostly held by the banks and more mature companies (although they don’t always get it right – and have the fines to show it). To win in international payments, you have to be great at both – which requires two very different mindsets. Revolut, – a company with a fantastic growth story- was reported recently as having compliances issues (the journalist created an account for her dog). Whether your goal is growth or profit, be mindful of who and what you are competing against and what it will take to win. We are very early in this race and only when a map can be drawn with virtually every meaningful player on the right-hand side might we begin to declare the race over.